The recent chilly weather has had its pros and cons. The downside for eager gardeners who have been nurturing seedlings and planting out bedding is that these tender charges now need protection to save them from harm. 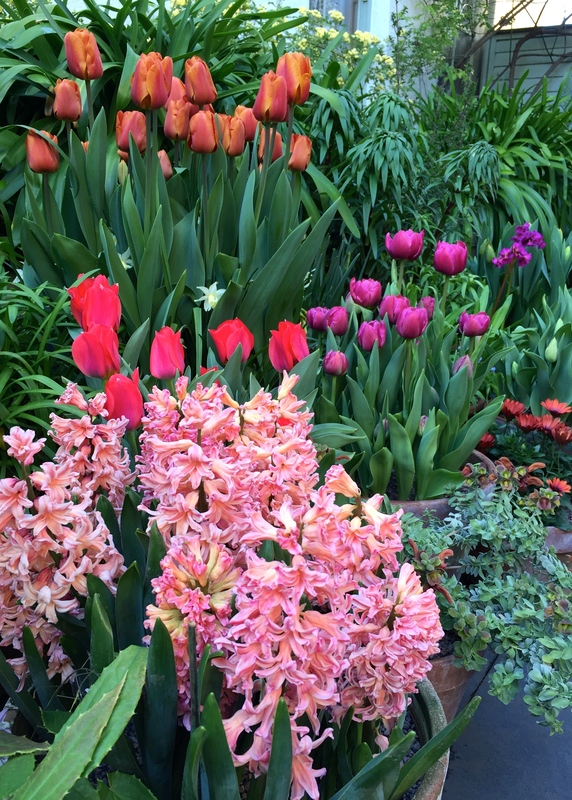 The upside, for those of us who love spring bulbs, is that the cold has prolonged the display of flowers, which can be so fleeting when it’s warmer. 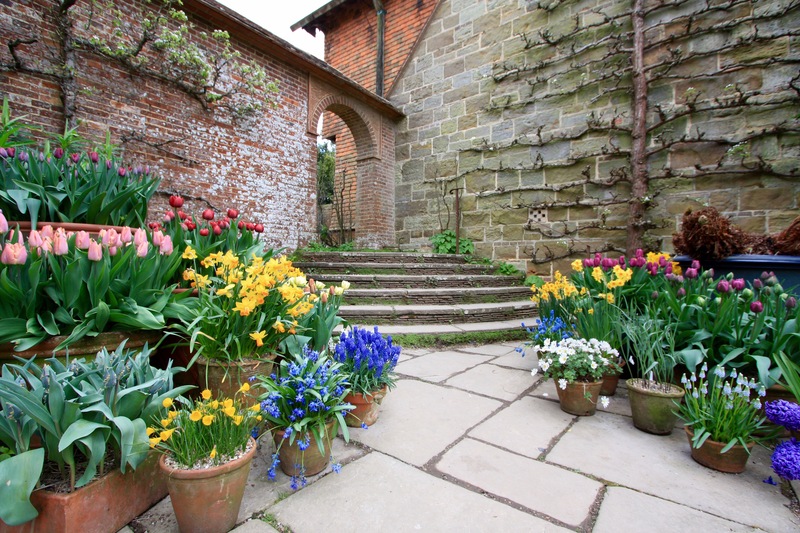 Owing to my own tardiness when it came to getting my bulbs into pots last autumn, the flowering of tulips and daffodils at The Watch House was already delayed by several weeks: I would not be at all surprised if I still had daffodils flowering in May. However, flower they will, and the succession of colourful bowls, chalices and trumpets exploding from pots around my front door will give me joy for that much longer. In three months’ time I will sit down and plan my spring displays for next year. The bulb catalogues will start to plop through the letter box immediately after Chelsea, but it’s a while before I can bring myself to peruse them. I have three sources of inspiration when it comes to which bulbs I choose: my own garden, based on what’s worked well in the past; Sarah Raven, who has a genius for combining bulbs in the colours I favour; and Great Dixter, one of the few great gardens that celebrate the art of planting in pots. Like me, Great Dixter’s creator, Christopher Lloyd, was not interested in polite gardening. Nor was he concerned by making his garden ‘low maintenance’, a ghastly term which sets my teeth on edge in the same way as ‘lite bite’ or ‘omnichannel’. Christopher was famed for breaking the rules and experimenting with new plants and brave colour combinations, often changing bedding schemes three or four times a year. Potted plants, especially annuals, tender perennials and architectural exotics were, and still are, used in large, skillfully staged and regularly revised arrangements. The impact of beautifully grown, unusual plants, combined for theatrical effect is always thrilling. Since our garden at The Watch House was created ten years ago, I have striven to achieve the same drama, albeit on a smaller scale. The catch for the average gardener, and I count myself as one of them, is where to put all these pots before and after their starring moment. In his book, Exotic Planting for Adventurous Gardeners, Christopher suggests an ‘out of the way space’, but acknowledges that a greenhouse makes it possible to include more exciting plants. My tiny new garden and greenhouse has given me a good solution to the challenge I have ‘next door’, although moving heavy pots between locations still means lugging them up and down the road. Before that I managed adequately by lining containers up along the narrow passage leading to our front door, or by hiding them in one of our basement light wells until they could reach up for the light no longer. No such challenges at Great Dixter of course, where there’s ample space in the garden’s nursery to nurture pots until they reach their prime. Nevertheless, the planning and planting of seasonal containers must be a mammoth and high-profile task for the gardening team. Visitors to Great Dixter expect the famous displays either side of the porch entrance, and in the Wall and Blue gardens, to live up to Christopher Lloyd’s brilliant example every time. By and large they do. 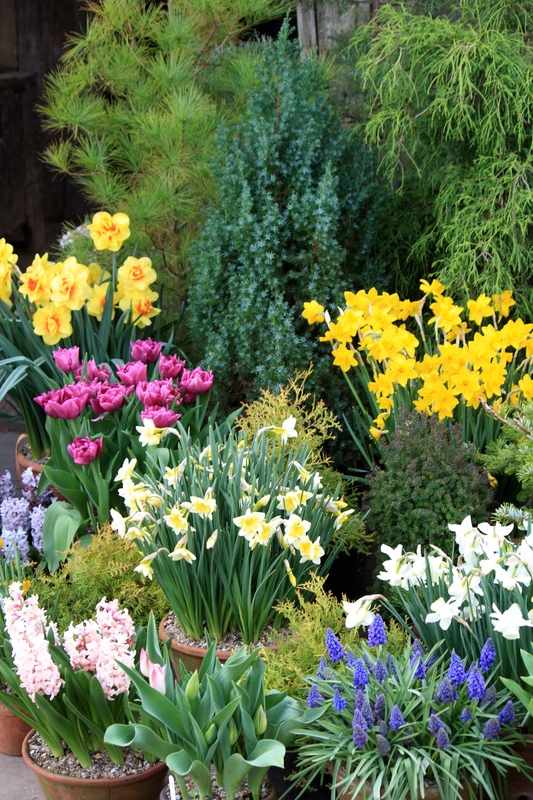 On the occasion of the Spring Plant Fair earlier this month they were gaily planted, each with a single colour or variety of narcissus, tulip, or hyacinth. Unlike Sarah Raven, who likes to mix colours that harmonise or bounce off one another, Christopher Lloyd preferred one colour per pot: so do I. 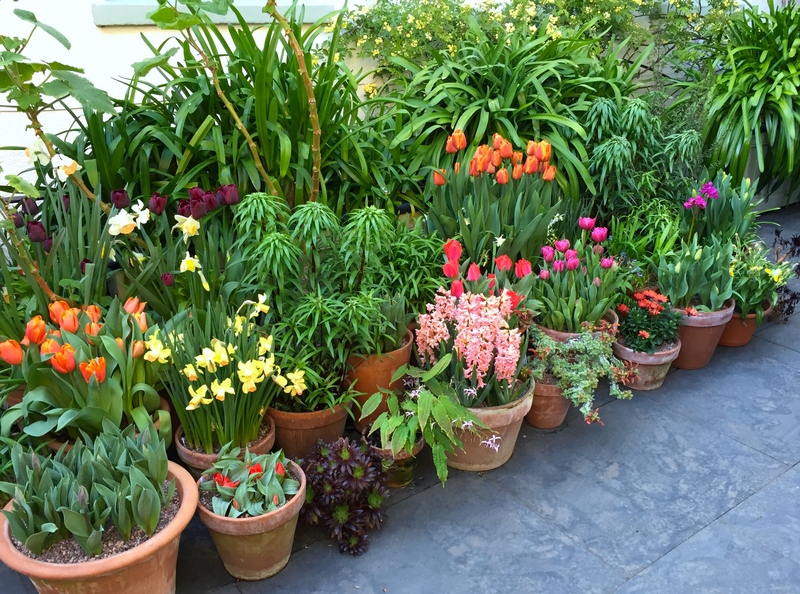 Mixed plants and colours are fine when the container is particularly large, or standing in splendid isolation, but when grouped together they can look a bit messy. This is the look I am trying to achieve at The Watch House … sometimes I get close. 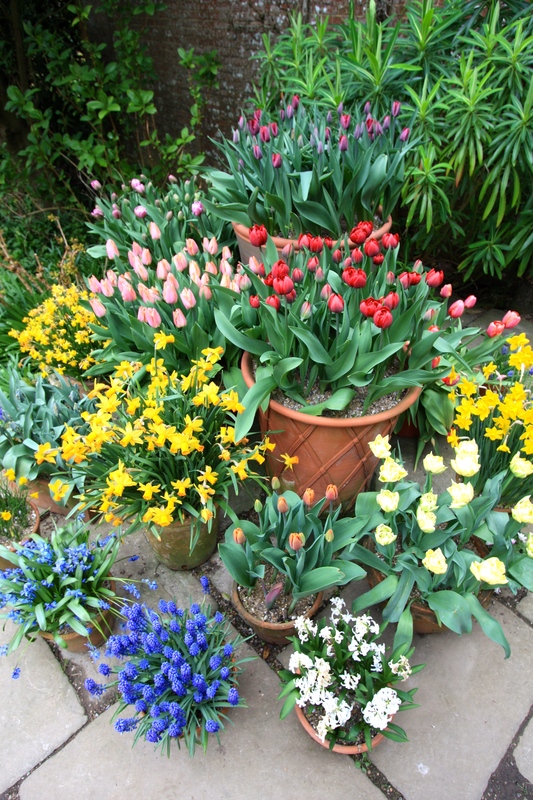 I pack my bulbs in by planting them in multiple layers, but am still astounded by the density of flowers, narcissi especially, that force themselves into the chill air from Dixter’s army of terracotta pots: in the larger ones there must be between 50 and 100 bulbs. To recreate this at home without going bankrupt it’s a good idea to buy from a wholesale catalogue, such a J. Parker, rather than a retail outlet. That way you get a lot more bloom for your buck. On my recent visit the colour combinations were not exactly sophisticated, but that’s OK. For me, spring is when I simply need a blast of bright, in-your-face, rude colour to shake me out of my winter stupor. These pots certainly did the trick. The scent of hyacinths and narcissi was enough to sooth any biliousness caused by clashing colours, and the backdrop of conifers, a plant group Fergus Garrett will undoubtedly propel back into vogue very soon, added a touch of retro garden glamour. Although hard work at times, pots are enormous fun to work with, offering opportunities to try new things before committing them to the border. Even if you begin with three, five or seven pots in a group, you can quickly and cheaply create a spectacular display with as much fire power as the most carefully conceived herbaceous border, yet in a fraction of the space. And, when the flowers fade, you can whip the plants out and replace them with something more exciting. The best kind of instant gardening. Dearest TFG – your bulb theatre is up there with GD – looks so beautiful. YOu desserve to be very proud of your efforts. Well, sometimes less is more Helen. The daffs you have chosen sound tres elegant and very stately. As for you mystery bulb bed, that will be a riot when it gets going. If I had one of those it would need to be the size of a field! Considering many bulbs come from habitats with poor soils I am sure they will do OK. Any that clash you can always pick for Indoors. Still frightfully cold here and so dry. I spent all last night watering our London garden with a hose. It’s normally August if I have to that, sometimes not at all. So much for April showers. Just have to hope and pray we don’t get a deluge that washes everything away. Have a fab weekend. Dan. The bulb garden is breathtaking! Anything that prolongs the beautiful blooms is worth it. The pots in a group is a statement piece, I will be doing this after seeing your post 🙂 Happy gardening!! Great post, much obliged. 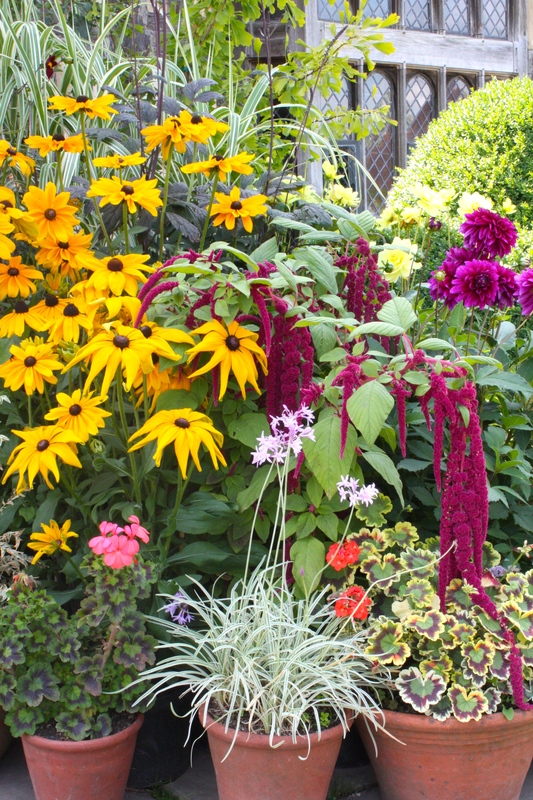 What is the plant with the droopy ropes of red/maroon flowers in the scene with rudbeckia, geraniums, tulbagia etc? The steps off our patio down to the lawn are adorned with pots, although a rather workaday collection in comparison to yours and GD. It’s a work in progress. Tulips in the main, the daffs are long gone, some wallflowers for old times sake. The tulips have been going for weeks but are beginning to drop petals. I’ve been ruthless with the scissors, lopping off offending stems, so the display (grand term for it) looks neat if a little depleted. Couple of weeks left I think. Lack of rain has meant they are not getting a beating. Next spring’s project is the front door which is relatively unadorned, a shame as it is rather obviously higher traffic and more visible. Pip Pip. Always something to do isn’t there? The plant you enquire about is Amaranthus caudatus aka love lies bleeding. We used to grow it a lot when I was a child. I’ve seen it used often at Dixter to dramatic effect. Yes, gorgeous in both sites. I always resolve to ‘do better’ when I see your spring displays and this year I managed a little display in ‘The Fortnight Garden’. In London I am still fearful of what the squirrels will do to the bulbs. 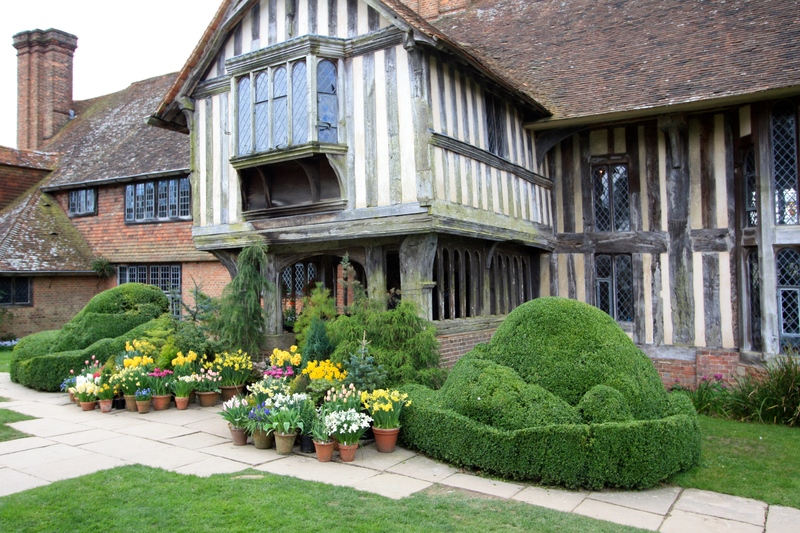 After my visit to Great Dixter last April I was inspired to plant up about 30 pots. It has been a great deal of work taking them out of the garage to put them on the front step each time it warmed up. Then it would drop down to minus 12 and I would have to take them all back in. A couple times I got lazy and thought they might not mind. They minded, some of my Tete a Tete even revolted and didn’t recover. There have been a number of successes, Minnow, Artist Muscari, Big Smile Muscari were terrific. Thanks for showing me GD this April since I can’t be there! Your pot display is really good, congratulations on your efforts and accomplishments! 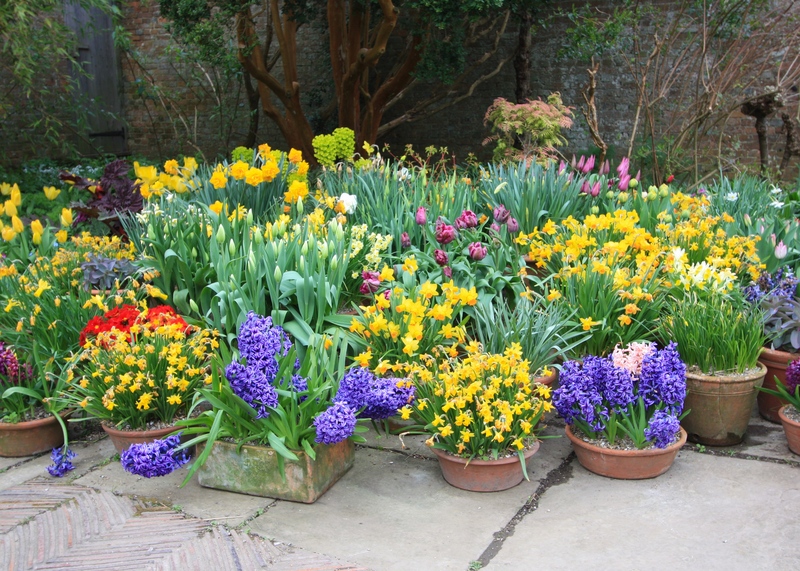 Great Dixter’s pot displays have always been an inspiration to me, your pots are wonderful too and have reinforced the message that more bulbs mean more impact. I must try harder, though I’m not sure I can match your efforts. I will have to tell Mr TT that I need to buy more pots and need a bigger bulb buying budget. Definitely. I bought my bulbs from J Parker’s wholesale catalogue last year. I was not sure what to expect but the bulbs have turned out to be really excellent quality at a fraction of the price of Sarah Raven et al. The range of varieties is also extraordinary – there were very few varieties I could not find. Even if your budget doesn’t budge, perhaps give them a try? I think Great Dixter might be my favourite spring garden, because of the pots. Thank you for sharing your visit. My pleasure. I am hoping it will be the first of many visits to Dixter this year. I’d like to follow the progress of the pots through the year and see what further ideas I can glean. J Parker’s have also been highly recommended by a friend, and I have had a look at their website. What a choice! Definitely go wholesale though. Prices are quoted in 50s and 100s but you can buy fewer bulbs if you wish. I make 50 a minimum so that I have enough of each variety to fill two decent sized pots. Thank you for your interesting post on bulbs in pots. I love the pots of Dixter but yours too! I moved from a house with a (small) garden last year to an apartment with a balcony and are gardening in pots, which I actually like. 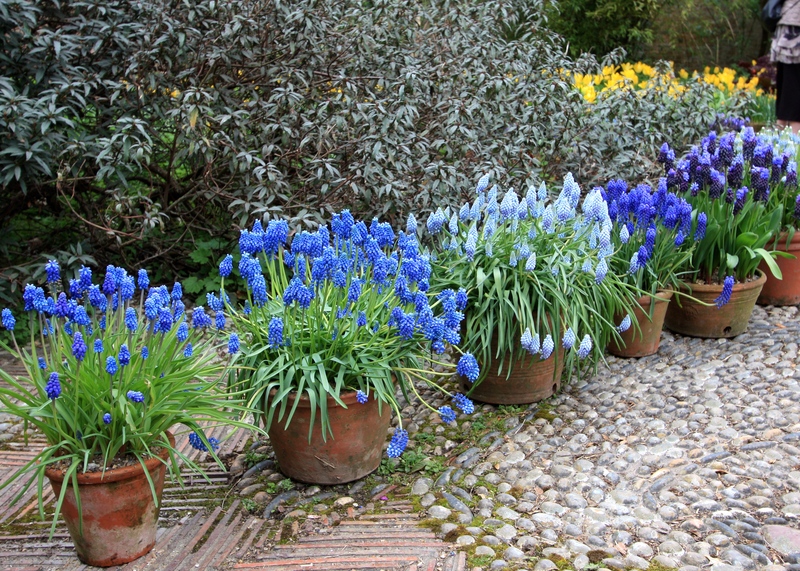 The bulbs in the pots are wonderful. I notice you mention potting them in layers for more flowers. I see per pot only one kind of bulb. Does that mean the same kind of bulbs in layers per pot? What a good idea, because I guess the bulbs in layers take up less space in the soil and give more flowers. Well, too late for me this spring but I’ll give it try for next year. One of the more difficult issued of gardening in pots is : where do I leave them after the bloom? I don’t have much space. Any tips are very welcome! Hi Cynthia. Best advice I can offer you, especially if you are balcony gardening, is to throw them out after flowering and buy new bulbs in autumn. This will get you the best results and make way for summer flowers. The alternative is to feed your bulb and keep them in good light to help the bulbs bulk up for another year, but often they will divide and not produce flowers the next spring. Such lovely flowers – I could lost there for a very long time. So happy to have come across your post and look forward to more tips, and gorgeous displays. Thanks and have a lovely day. You are most welcome Dusty. You have a good day too!